We bought a cam­era at For­tune Town. All good – and there I was at the sec­ond VAT counter. A stamp I had and thus I was after my $500+ refund. The woman looked at my forms, looked at me, looked at my forms, looked back at me and said, not orig­i­nal invoice. What? No … they are. I looked at them and it seemed they were the copy from the sec­ond lay­er of the print­ed slip. Why did that make a dif­fer­ence? But it was lit­tle use and she gave me a card with a num­ber to call and a ref­er­ence num­ber if I had any prob­lems. I didn’t for a moment think I wouldn’t. Two months passed, and I was back in Thai­land. There was no mon­ey, so I rang the num­ber on the card. It was dis­con­nect­ed. I found a “VAT For Tourists refund” num­ber on a Thai gov­ern­ment site and rang it. After going from per­son to per­son (you could sense the speed at which the phone was passed), none of whom spoke any Eng­lish final­ly some­one respond­ed: she screamed and hung up. I rang back and went from per­son to per­son. This time I end­ed up with a nice lady who took my pass­port num­ber and told me to wait. The line went dead again so I called back and went through the litany of nervy peo­ple until I was back with the nice lady. Declined, she said – you need orig­i­nal invoic­es. I tried to explain but even­tu­al­ly asked if I could get the ‘orig­i­nal invoic­es’ was it pos­si­ble to bring them in – it was, after all $500. There was silence as she seemed to fum­ble for a response. You could feel the ter­ror com­ing down the line. You could smell it. Ka… You must come to the 17th floor. I am Khun Celia. In the next two days I gath­ered the invoic­es from home and vis­it­ed the cam­era store – I was com­plete. Orig­i­nals. I scanned them – there was no way I was going to hand these over unrecord­ed. Thus, on Wednes­day next, I called a cab. It was a scorcher – high 30s and ris­ing with nary a cloud – when I set off for the address in Aree list­ed on the web­site I had gath­ered the num­ber from. The entrance on Soi Aree 1 was impres­sive: large gates and a sign in both Eng­lish and Thai that said The Min­istry of Finance and The Trea­sury. Behind it, a long dri­ve went past secu­ri­ty and a big car park towards a very large build­ing sur­round­ed by sev­er­al small­er ones. The taxi dropped me at the entrance to the big build­ing and I approached the door­man. 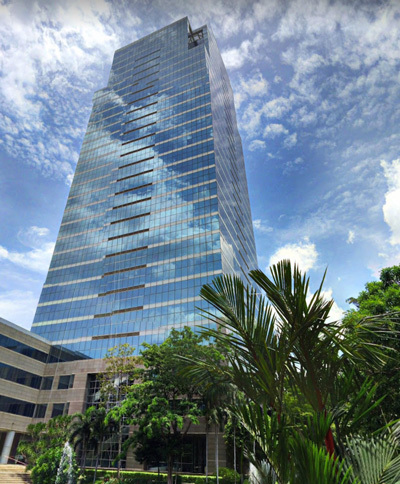 In frac­tured Thai I asked for the VAT Refunds For Tourists office on the 17th floor. I point­ed up – and quick­ly under­stood there were at the most 5 vis­i­ble floors. Per­haps the tow­er was at the back – it was, after all, a mas­sive build­ing sur­round­ed by oth­ers. I asked the door­man again and he wan­dered away with­out say­ing a fur­ther word so I went into the big foy­er. Way down the back – maybe 100 metres – behind wide stairs, there was an esca­la­tor door, so I ambled down there, hop­ing for an easy path to the elu­sive 17th floor. It said 1–2-3–4-5 so I reversed course and walked towards a door on the left side. I walked into a vast room with hun­dreds of desks, each one manned or wom­aned by a per­son in a brown uni­form. Uni­form­ly they saw me walk in and as one all quick­ly ducked under their broad desks. I left and walked across to anoth­er door on the oppo­site side. I walked in and had an exact rep­e­ti­tion of dis­ap­pear­ing heads. I was the mon­ster. Slow­ly, around desk 282, a girl stood. She crept slow­ly towards me, head bowed. Hel­lo, I said. VAT? Tourist? Can you help? Hav­ing found the one brown clad clerk who was will­ing to risk the farang I was not going to walk away. She looked at me and asked, in decent Eng­lish, what do you want? The VAT Refunds For Tourists office – it’s on the 17th floor. She wan­dered away and talked to anoth­er per­son – under a desk – and returned. We have no 17th floor. I’d gath­ered that, so I asked again: where is the VAT Refunds For Tourists office? I asked in Thai too. She indi­cat­ed that I should fol­low her, and we went back to the door­man. After a con­fer­ence she looked at me. Where is it? That $500 was look­ing elu­sive and I was won­der­ing if it was worth it but that thought quick­ly passed when she returned from a sec­ond con­fer­ence with anoth­er door­man: it’s in the Rev­enue build­ing. You are in the Trea­sury build­ing. Ok, so where is the Rev­enue build­ing? You go out the door and turn left. Then you fol­low the road for 500 metres. No, you then turn right and walk 500 metres until you see a Star­bucks. No, turn left and walk past towards a lake and a tall build­ing. No, that’s the Min­istry of Nat­ur­al Resource and Envi­ron­ment. You go past that and then you will see anoth­er big build­ing. No, that’s the Depart­ment of Water Resources. It’s behind that. I thanked her, and she wai-ed and rapid­ly scur­ried back to her desk. Heads popped up as I left and walked out. I bet I was the talk of the office for days. I walked out and there sat a pris­tine tuk-tuk and smil­ing dri­ver. He looked at me and I looked at him. How much to go to Rev­enue? 500B he said, and I told him to piss off. 150B will take me across this vast city in an air-con­di­tioned cab. He smiled and shrugged so I set off. It was warm. In fact, it was now very hot and this was in a time before that pleas­ant lady doc­tor at Bum­run­grad Hos­pi­tal rubbed my head and said, you need to wear a hat from now on. The RealFeel™ said 44 but I’d come this far so I head­ed on. The tuk-tuk guy called out four hun­dred. It wasn’t even a start­ing point so off I trekked, receipts and name in hand, look­ing for the 17th floor. The first five hun­dred metres were rel­a­tive­ly easy – although my blood tem­per­a­ture was clear­ly ris­ing – and was eased by a large water from the afore­men­tioned Star­bucks. I turned left and car­ried on under the ear­ly after­noon sun. The sec­ond five hun­dred seemed to go on for­ev­er and I began to duck from tree to tree all the time look­ing up hope­ful­ly for a cloud that nev­er arrived. The Min­istry of Nat­ur­al Resource and Envi­ron­ment did arrive though. It had a very large pond out the front, one which looked like it could be rather love­ly if tend­ed. Today, how­ev­er, it was green and stag­nant-look­ing, smelled a great deal and had plas­tic bags and bot­tles much like my Star­bucks bot­tle float­ing in it. It extend­ed to the next build­ing, The Depart­ment of Water Resources. I held my nose and eased past the depress­ing pond in front of the Depart­ment of Water Resources. Peo­ple in brown uni­forms went past me in an assort­ment of tuk-tuks, all bemused, some per­haps could have recent­ly been found under desks. Few – if any – farang prob­a­bly ven­tured into this epic gov­ern­ment com­pound. Even few­er took the perp walk from Trea­sury to Rev­enue past the stag­nant pond out­side the Depart­ment of Water Resources. You just didn’t, you just gave up when con­front­ed by daunt­ing and com­pre­hendible Thai bureau­cra­cy and dead phone lines. And lordy, then, though eyes cloud­ed by tor­rents of salty sweat, I was there. Before me stood a very big build­ing – not just tall but wide in each direc­tion. The sign said Rev­enue Depart­ment and reas­sured, I wan­dered into the point­less­ly immense three storey foy­er. There, in the far cor­ner was a small desk. The rest of the vast foy­er was emp­ty aside from two up and down esca­la­tors lead­ing to a small mez­za­nine with three lift doors. I walked to the desk: Khun Celia? 17th floor? I enquired hope­ful­ly and des­per­ate­ly. The non­plussed (as in she didn’t duck) lady at the desk – whose brown uni­form had badges of what I assumed were rank – looked at her screen. VAT Refund for Tourists? I added for detail. She peered and scrolled and peered and searched. 17th floor she said and point­ed up to the ele­va­tors. But I need your pass­port. It was a trick, I knew that straight away: no pass­port, no refund …. so, I declined. She looked con­fused then annoyed, so I offered my NZ ANZ ATM card. It was enough, and I was hand­ed a pass to tag on my sweat infused shirt. The guard waved me up the esca­la­tor, check­ing my pass care­ful­ly to, I guess, ensure I hadn’t swapped it for a fake in the last thir­ty sec­onds since he’d seen it hand­ed to me. And then I was at the 17th floor. There were two doors – one said: VAT Refunds and the oth­er said VAT Refunds. I took a chance. I walked into the office and heads dropped below large num­bers desks in swift uni­son. Hel­lo, VAT Refunds for Tourists? Noth­ing hap­pened. I said it again and a young man appeared from behind a wall. He looked at my hand­ful of now-grub­by receipts and wan­dered off with­out a word. I stood for what seemed to be an eon and then – from the oth­er end of the big room came a petit young lady. Khun Simon, she asked qui­et­ly. Khun Celia? Please be Khun Celia…. She nod­ded, smiled and said, you are late. We expect­ed you at 12 o’clock. She spoke slow­ly in halt­ing­ly pass­able good Eng­lish but refused to look me in the eye. She point­ed to a dis­tant desk, the last one in the room, and we walked down there. You must talk with Khun Pra­vat, he is in charge of VAT Refunds For Tourists cus­tomer rela­tions. The same young man as before looked at me and said some­thing in swift­ly Thai. I under­stood a few words but asked if he could per­haps speak in Eng­lish? Khun Celia explained quick­ly that Khun Pra­vat spoke only Thai. So, the man in charge of cus­tomer rela­tions for the VAT Refunds For Tourists spoke no for­eign lan­guage. At least he wasn’t hid­ing from me. Khun Celia, who I’d decid­ed I liked, offered to trans­late. Good, I think. And it most­ly was until it came to the part about me leav­ing the receipts there and they would get right back to me. I knew that I would nev­er see the receipts or the mon­ey if I left them with the man who spoke no Eng­lish at VAT Refunds For Tourists who was the cus­tomer rela­tions depart­ment. This was lost in trans­la­tion and took me a good five min­utes to explain with­out offend­ing their ‘pro­fes­sion­al­ism’. I got there, by sug­gest­ing a mid­dle ground: I would leave the invoic­es there if a) I could take a pho­to of the two of them hold­ing them, and b) they would sign the scan of the invoic­es I had, agree­ing that they had these. Thus, I took a pho­to of the pair, both also hold­ing their ID cards. These I not­ed on my scan too. They signed. Khun Pra­vat and Khun Celia seemed hap­py with this process and asked to look at the pho­to which they did so, very approv­ing­ly. I promised a copy when I was paid. Self­ies – even ones tak­en by sweaty farangs – always open doors in a coun­try where most peo­ple only com­mu­ni­cate at meal time via social media. We took a sec­ond shot of the three of us smil­ing with thumbs up. I think this last one was the piv­otal deal clinch­er. My refund now had social mean­ing. We bowed with wide smiles. I wished my new friends and their fam­i­lies chok-dee mak (much good luck), and we all touched our hearts and I left. In the foy­er I retrieved my ATM card and walked out­side. The man with the tuk-tuk was there so I smiled at him too and got in. The mon­ey arrived on my cred­it card two weeks lat­er and I for­ward­ed the pho­tos. I have no doubt they are some­where on Insta­gram as I type.